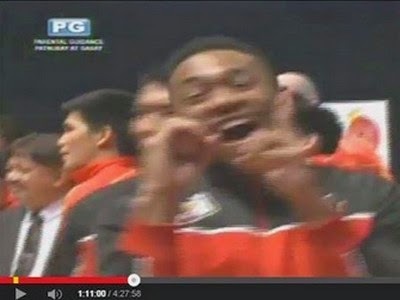 Spootted: Calvin Abueva flashing the 0-1 hand gesture during the PBA Season 40 Opening Ceremonies inside the Philippine Arena in Bulacan. We all know what this means for Ginebra fans because Ginebra had a game on the same day against the Talk 'n Text Tropang Texters, wherein BGSM won, 101-81. Calvin and the BGSM Fans have bad blood in the past especially during the Ginebra-Alaska games in PBA Season 39. MAGALING TONG SI ABUEVA.. SAKSAKAN LANG NG YABANG!